Twitter is a microblogging service that’s changing the way we communicate. Marketers recognize its value, and Twitter Marketing: An Hour a Day offers marketers, advertisers, brand managers, PR professionals, and business owners an in-depth guide to designing, implementing, and measuring the impact of a complete Twitter strategy. Expert author Hollis Thomases acquaints you with the Twitterverse, its conventions, and its fascinating demographics and statistics. She then teaches you step by step how to effectively craft successful branding and direct response strategies that can be scaled to any organization and its objectives. 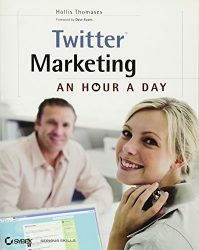 Twitter Marketing: An Hour a Day uses interesting case studies, success stories, anecdotes, and examples to demonstrate how to use Twitter metrics in order to inform strategic direction. You’ll discover how top companies-large and small-have leveraged this exciting communications platform. Twitter Marketing: An Hour a Day is the ultimate guide to succeeding one tweet at a time! An essential guide and reference for marketing with Twitter I am not a marketing person per se, but as a business executive I have to appreciate any resource that helps me get my arms wrapped around a new technology and how it can be leveraged to improve my results. I have been a Twitter user for nearly two years, but my use is limited mostly to personal networking, following news in my industry, and staying connected with my home city while I travel extensively on business. Textbook meets Reference Book This book was certainly the most interactive books I’ve ever read; even more so than those `Choose your Own Adventure Series’ books that I will never actually admit to purchasing. The medium in which the author made her book available played a huge role in my enjoyment of the material. I was able to purchase her book through the Kindle store on Amazon.com and download it onto my iPhone. This made it extremely convenient to interact in `real-time’ with the various website links that Thomases provided in her data references. This `interactive’ theme carried its way throughout the entire book, enabling me to be `just click away’ from relevant blogs, stories, feeds and references.